Located within walking distance of the Anaheim Convention Center, Disneyland & California Adventure Park. The elegantly flavored bar provides specially priced happy hour selections! Stop by for some great food, a truly elegant experience! Great food and great service. Price is higher than standard restaurants, but you get what you pay for. I will come here again when I'm in the area. I recommend the Bar Bites during happy hour (open-6:30 & 9pm,-close). Drinks are still full price, but the food is great during happy hour. Overpriced, the ambiance and service in this restaurant does not make up for it. If I order a $50 steak and a $13 potato I expect for someone to ask me if my food is okay after it is served to me. I also expect someone to stop by to ask if maybe I want something else, like dessert or coffee after dinner? Made the mistake of using the "private" room. Apparently "private" to them means sharing it with another very noisy table and we were charged extra for that privilege. I have no problem paying premium prices for very good food that is beautifully presented and accompanied by good service. I was disappointed and would never go back. My boyfriends favorite restaurant and now I know why...got the Filet and was to die for. Our server (also named Beth...no wonder she was great) was simply awesome. We could have eaten all night!! 5 STARS!! 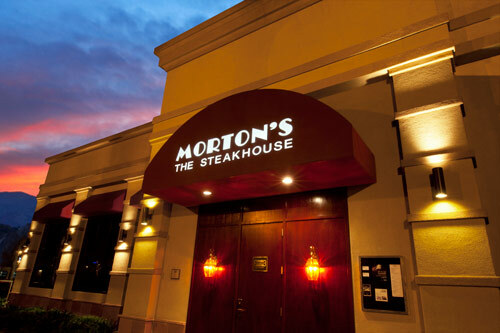 We visited Morton's after attending a convention in Anaheim. Our reservation was for 7:15. It took some time to get seated, but that wait was nothing compared to the wait for our drinks and appetizers. After 45 minutes of no drinks or food (other than the bread) we decided to leave hungry. We where lucky enough to get same day reservations for a party of eight. The atmosphere and level of service is excellent. Our table had a view of the open kitchen and enjoyed watching the chefs preparing food. Only one person in our party had complaint which was dealt with promptly and at least times managers came to the table to apologize and make sure she was satisfied. Everything I ate was delicious. Raw oysters on the half shell was fresh and plump. The center cut iceberg salad was great and I loved the grilled asparagus. This "classic" chophouse chain is a "first choice" for many, thanks to its "fabulous" steaks, "superior" sides and "excellent wines" served in "sophisticated", "men's club" settings; bills can be "astronomically high", but with almost "embarrassingly attentive" service, most agree it's "worth it" for special occasions.